With the violence and religious extremism that has indelibly shaped the contemporary world’s perception of Afghanistan, it often goes unremembered that the region for centuries flourished as a cultural crossroads of trade and Buddhism along the Silk Road. Thirty kilometers (about nineteen miles) from the Afghan capital of Kabul, under layers of unexcavated earth, lays an ancient Buddhist monastery. Started around the first century C.E., the site, Mes Aynek, is a trove of Buddhist monastery ruins, statues, and stupas attesting to the prolific role that Afghanistan played in the proliferation of Buddhism in Central and East Asia. 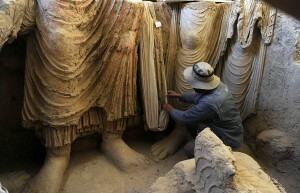 "An Afghan archaeologist looks at the remains of Buddha statues discovered inside an ancient monastery in Mes Aynak, in the eastern province of Logar on November 23, 2010." In the first-century B.C.E., the Yuezhi people were forcibly driven westward from East Central Asia to Ferghana and Bactria in present-day northern Afghanistan. Prior to around 126 BCE, Bactria had been governed by the Indo-Greeks, vestiges of the Alexandrine empire, who promulgated their rule and the Hellinistic culture throughout the region. Once the Yuezhi took Bactria from the Indo-Greeks, they established the Kushan Empire which played a prominent role in the early periods of the Silk Road. It was through the Kushans that the woolen textiles, gold, and silver of Rome flowed east; the cotton, spices, and semi-precious stones of India migrated north; the silk of China travelled west; and the rubies and lapis lazuli of Bactria and the Tarim Basin moved outwards. A 2nd-century C.E. 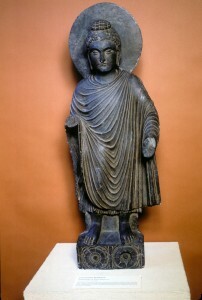 Gandharan statue of the Buddha from the University of Pennsylvania Museum exhibiting Greco-Roman influences. The Kushan Empire also played a vital role in the dissemination of Buddhism from India to Central Asia where it eventually found its way to China and then Japan. The Gandharan school of Buddhist art, propagated by the Kushan Empire, shows express evidence of the influences of anthropomorphic Greco-Roman forms and stylized Indian naturalism. In this way, the Kushan Empire not only directly facilitated the transmission of Buddhism to Central and East Asia, but also left an ineffaceable mark on the ensuing Buddhist artwork of Asia. While Silk Road trade in the region diminished slightly around the 3rd and 4th centuries when Kushan rule was broken up by the Sassanian Empire, religious eclecticism continued in much of the region. It was during this time period that many of the artifacts that are being unearthed at the Mes Aynek site were produced. In some places around the monastery, the ground is littered with slag, the blackened waste from the refining and smelting of copper ore, leading archaeologists to believe that the monks once exploited the lucrative copper deposits until deforestation halted their supply of timber fuel. The archaeological site, Mes Aynak, holds many invaluable relics of Aghanistan's history, but also the promise of billions of dollars of foreign investment. These copper deposits are what have drawn the Chinese Metallurgical Group Corporation (MGC) to the site. The Chinese government-backed mining company has invested 3.5 billion USD, Afghanistan’s largest foreign investment, in developing the mining site and the Afghan government hopes to see 880 million USD from the project before production even begins. However, upon the signing of the Chinese contract in 2008, an agreement was reached to halt further mining explorations that would damage the historic site until 2011. As 2010 draws to a close, archaeologists acknowledge that three years may be time enough to document, but not properly preserve all the known artifacts – a process which may take up to ten years. For the struggling Afghan economy, the MGC project is the country’s single largest foreign investment and a promise for the creation of many jobs. However, due to governmental corruption, it is not likely that the financial boon of this Chinese investment will be used to address the lack of stable infrastructure, water, electricity, housing, jobs, and medical care and the incredibly low standard of living plaguing many Afghan people. 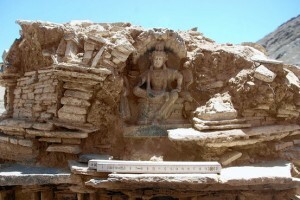 In an article published by the Wall Street Journal, French archaeologist documenting the site, Phillippe Marquis, stresses that while a copper mine might be profitable for the next 20 to 30 years, the wealth of cultural history that would be unearthed and preserved from Mes Aynak “[is] for everybody…for the future of Afghanistan.” Nevertheless, while an enduring manifestation of Afghanistan’s rich cultural past would serve well to remind the world of the country’s reputable history, during this time of political and economic instability, it is hard to justify.